Betsy DeVos is proposing changes to Title IX. What will this mean for Washington schools? After seeing a draft of Secretary of Education Betsy DeVos' proposed changes to handling sexual misconduct cases, some sexual-assault survivors and their advocates see the recommended practices as potentially traumatic for survivors. Administrators at some Washington colleges say they hope to stick to their current policies for handling sexual misconduct cases — even after seeing a draft of Secretary of Education Betsy DeVos’ proposed changes, leaked this month. The changes would narrow a school’s responsibility to respond to sexual misconduct under Title IX, a federal civil-rights law that prohibits gender discrimination in publicly funded schools. The proposals would also allow them to use a higher standard of evidence and mediation for sexual misconduct cases, punish students for reports deemed false, and require cross-examination during hearings. Some sexual-assault survivors and their advocates see the recommended practices as potentially traumatic for survivors. “If these policies were to go through, less people would feel comfortable coming forward,” said Kalista Newman, a sexual-assault survivor and chair of Washington State University’s Associated Students committee on sexual violence. DeVos, who rescinded Obama-era guidance last year, has said these changes would make the process more fair to accused students and to schools. The leaked draft states that previous guidance lacked clarity about schools’ responsibilities under Title IX, leading accused students to sue their schools and prompting survivors to file complaints to the Office of Civil Rights, which DeVos has said was “weaponized” by the Obama administration. In Washington, as of Aug. 31, five public four-year colleges, three private schools, two community colleges and 15 school districts, including Seattle Public Schools, were under Title IX investigation, according to the Department of Education. Title IX coordinators at Washington colleges said they are waiting to see how the officially released proposal might affect them. Officials from Eastern Washington University, Central Washington University, the University of Washington and Washington State University said they don’t yet anticipate making significant changes. UW Title IX Coordinator Valery Richardson said she would be concerned if the final proposals require, instead of allow, schools to make some changes. In 2011, the Obama administration issued guidance expanding schools’ responsibility under Title IX, and schools adopted procedures and designated employees to handle cases of sexual violence. Last year, some Washington college officials told The Seattle Times that those changes — though controversial — improved the process for survivors. Some colleges are still responding to Obama-era guidance and feedback from students. Western Washington University’s president announced updates to how the school handles sexual misconduct cases in an email Thursday. Catherine Lhamon, who helped develop Obama’s guidance as his Department of Education’s assistant secretary for civil rights, said she’s concerned that DeVos’ changes would allow schools to ignore some reports of sexual misconduct. Under Obama, schools could be found in violation of their Title IX obligations for not responding to sexual harassment, interpreted as including all forms of sexual violence, if they knew or reasonably should have known about it. 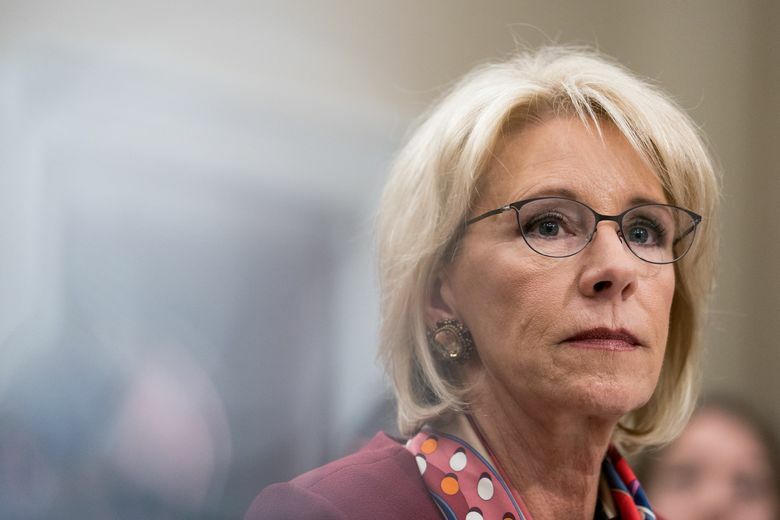 DeVos would narrow incidents involving students that require school response to sexual assault or sexual harassment “so severe, pervasive, and objectively offensive” it denies access to education, according to the draft. Schools would only be found in violation if they don’t respond to formal reports or multiple complaints about the same person made to an official with authority to respond. Richardson said she’s concerned with the proposal to allow schools not to investigate off-campus incidents that aren’t associated with educational programs or activities. There is off-campus student housing right across the street from the UW campus. The leaked draft cites a study that found off-campus incidents made up 41 percent of 305 sexual-assault reports analyzed from 104 colleges. The draft also includes allowing schools to choose what standard of evidence they use. The Obama administration’s Title IX guidance mandated that colleges use the “preponderance of evidence” standard of proof to make determinations in investigations. All of Washington’s public colleges now use that standard, which means they determine if there is sufficient evidence that sexual misconduct more likely than not occurred. DeVos has allowed schools to use a higher “clear and convincing” standard, which is higher than the Obama standard but still lower than the criminal standard of beyond reasonable doubt. The proposed changes would make this option permanent. The draft changes would also allow mediation if both parties consent and require cross-examination during hearings, which Obama-era guidance rejected as inappropriate. Some Washington colleges permit students to indirectly ask questions by submitting them to a hearing officer. Newman, chair of the ASWSU sexual-violence committee, said the proposal to allow schools to punish students they deem submitted false reports concerns her. Shiwali Patel, education senior counsel with the National Women’s Law Center, said false reports are uncommon and the department has failed to show this is a significant problem. A 10-year analysis of sexual-assault reports made to a university found that 5.9 percent were false. Patel is also concerned that the proposal that would allow both parties to access all obtained evidence, even if it isn’t deemed relevant to the investigation, could allow an accused student to retaliate against a survivor. The draft indicates that once the department releases a notice of proposed rule-making, there will be a 60-day public comment period. The department must respond to raised concerns in an introduction to the final rule.